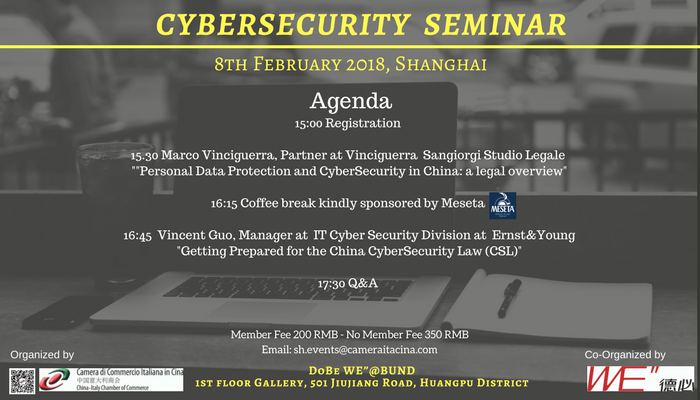 The China-Italy Chamber of Commerce invites you to take part at the Cybersecurity Seminar that will be held on 8th February in Shanghai hosted by our partner 德必WE" in their location in JiuJiang Road. The seminar aims to inform & lecture about potential dangers that might be encounter in today's online world, the event will offer also a deep legal insight given by one of our member . The coffee break will be sponsored by Meseta.